Go on a shopping spree for the entire family with Gap Canada. Shop online today and save 40% off Everything by using the promo code GAPTHANKS at checkout. In addition, save an EXTRA 10% off and receive FREE Shipping on all orders by using the promo code GAPYAY at checkout. This promo code ends Wednesday, December 5, 2018. 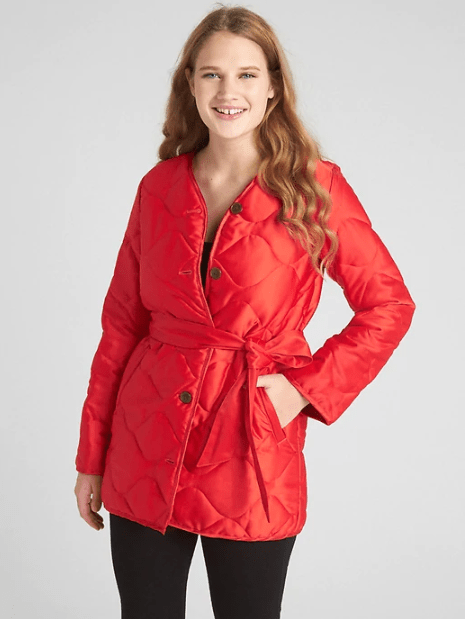 This Women’s Quilted Tie-Belt Coat is on sale for only $86.37 (originally $159.99) when you apply the 40% off promo code GAPTHANKS and the extra 10% off promo code GAPYAY at checkout. You save $73.62! Smooth, stretch quilted satin weave. Fully lined. Plush, lightweight padding. Long sleeves. Round neckline, button front. Removable sash belt ties at waist. Front slant pockets. Allover quilting. Gap is offering free shipping on all orders using the code GAPYAY at checkout. Click here to start shopping at Gap Canada!